The Opening of the Yachting Season - "Britannia" and "Iverna" in the Thames Regatta. An antique engraving from a drawing by C.W. Wyllie, which was published in the magazine 'Black & White' on Saturday, June 9th, 1894, with nlater hand colouring. Weston-Super-Mare Regatta - drawn by Condy. Page approx 24cms by 36.5cms. 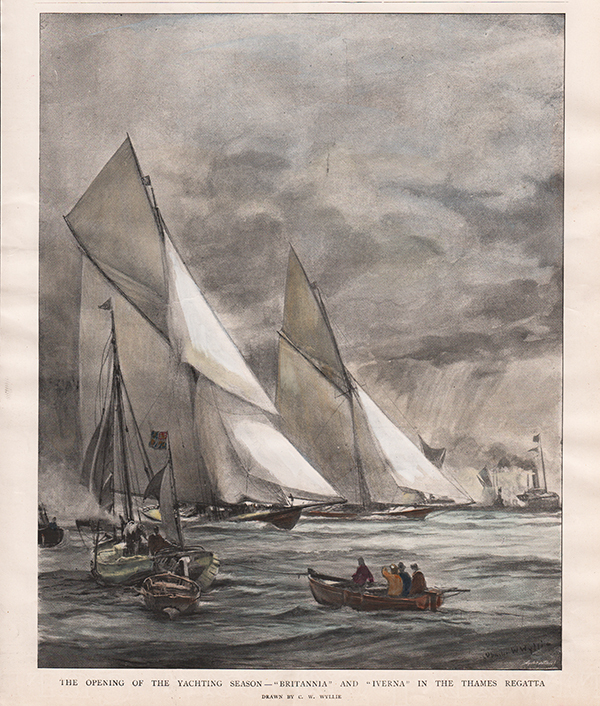 Royal Thames Yacht Club - The Schooner Match. A woodcut engraving which was published in "The Illustrated London News". Circa 1870 with later hand colouring. The yachts "Sverige" and "Rosalind" are shown. The Prince of Wales Yacht Club Match - Coming up Long Reach. An antique woodcut engraving which was published in "The Illustrated London News, 15 May 1858 with later hand colouring. 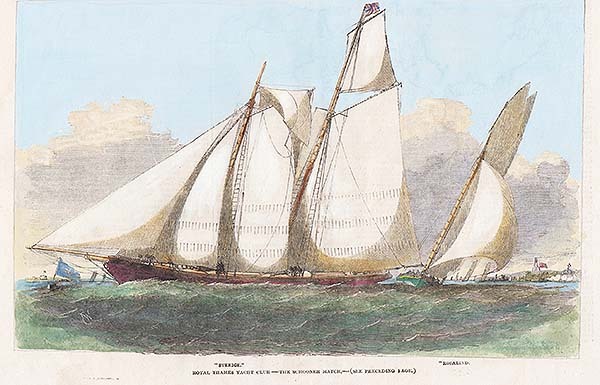 The engraving shows the yachts 'Undine', 'Julia', 'Emily' and 'Valentine'. Paglesham Regatta - Start of First Class Oyster Smacks. An antique woodcut engraving which was published in "The Illustrated London News" on July 17th, 1858 with later hand colouring. 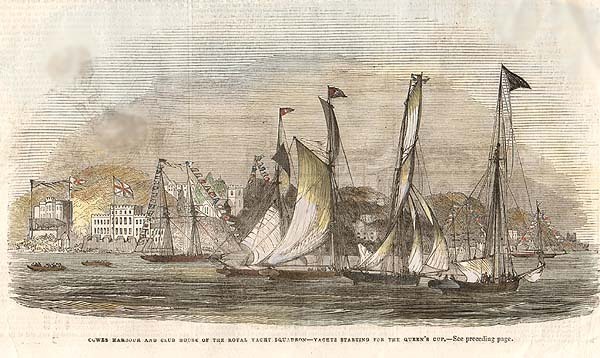 The engraving shows the yachts 'Britannia', 'Rosalind', 'Don Juan', 'Waterwitch' and 'Gnome'. 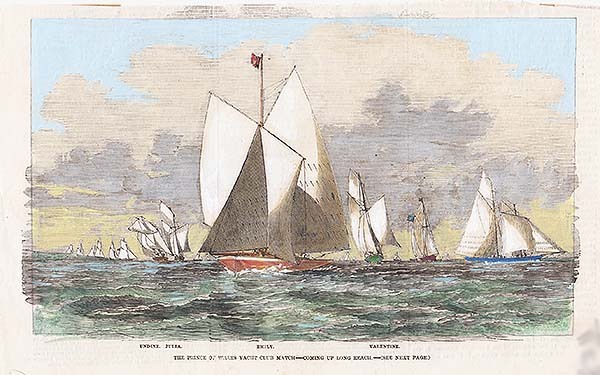 The Royal Thames Yacht Race - The "Maggie" and "Buttercup beating down. An antique woodcut engraving which was published in 'The Graphic' newspaper on Saturday, June 6th, 1881 with later hand colouring. An antique print entitled "Tiggy" produced for the famous Victorian Magazine "Vanity Fair" founded by Thomas Gibson Bowles which commenced publication in 1869. For about forty five years caricatures of famous and infamous personalities were carried in the weekly issues of Vanity Fair. Subjects included Royalty, judges, politicians, musicians, sportsmen, artists, actors and criminals of Victorian and Edwardian Britain. This print by 'Spy' was published on 7th August, 1907. Two Famous Racing Yachts "White Heather" and in the distance the "Kariad". Published in a "Supplement to the Illustrated London News" on August 3rd, 1907. Short account of the race beneath image. The Voyage of the "Little Western" across the Altantic. More Info An antique woodcut engraving which was published in "The Graphic" newspaper on Sept. 18th, 1880 with later hand colouring. Inset images of Mr George Thomas and Mr Fred Norman. An antique woodcut engraving which was published in "The Graphic" newspaper on Sept. 18th, 1880 with later hand colouring. Inset images of Mr George Thomas and Mr Fred Norman. More Info An antique woodcut engraving which was published in "The Illustrated London News" on July 15th, 1843 with later hand colouring. Participants were the yachts 'Mystery' and the 'Enigma' and the race was from Blackwall to Holly Haven and back. The victor was the 'Mystery'. An antique woodcut engraving which was published in "The Illustrated London News" on July 15th, 1843 with later hand colouring. Participants were the yachts 'Mystery' and the 'Enigma' and the race was from Blackwall to Holly Haven and back. The victor was the 'Mystery'. The Sailing Match off Greenwich. More Info An antique woodcut engraving which was published in "The Illustrated London News" in 1843 with later hand colouring. 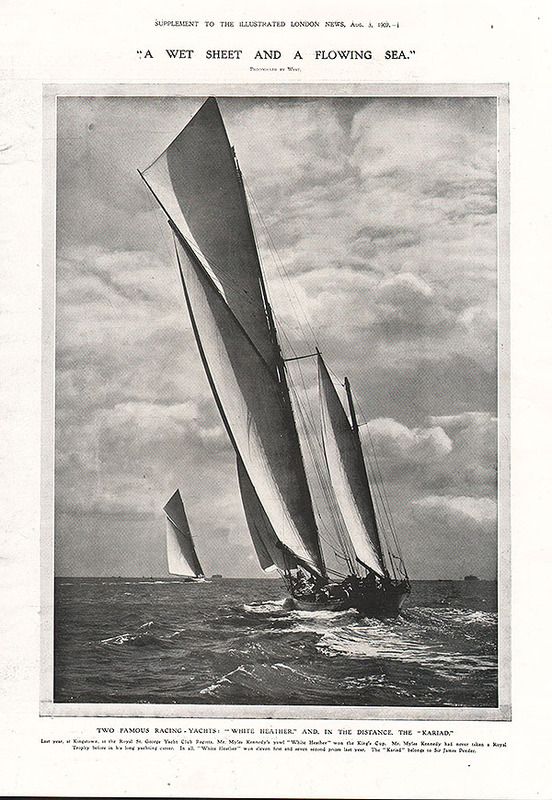 The engraving is accompanied by a report on the race and list some of the yachts and their owners. An antique woodcut engraving which was published in "The Illustrated London News" in 1843 with later hand colouring. The engraving is accompanied by a report on the race and list some of the yachts and their owners. The Volna (Wave), Iron Schooner Yacht, built at Blackwall, for the Grand Duke Constantine of Russia. An antique woodcut engraving which was published in "The Illustrated London News" on September 16th, 1848. Lowestoft Regatta - The Review of the Yachts. An antique woodcut engraving which was published in "The Illustrated London News" on August 4th, 1855 with later hand colouring. The yachts are "Titania", "Coquette", "Will o the Wisp", "Novice", "Maud" and "Mayfly". Cowes Harbour and Club House of the Royal Yacht Squadron - Yacht's starting for the Queen's Cup. More Info An antique woodcut engraving which was published in "The Illustrated London News" on August 26th, 1843. An antique woodcut engraving which was published in "The Illustrated London News" on August 26th, 1843. Royal Thames Yacht Club - The first match for the season, on Wednesday last - The finish off Greenwich. An antique woodcut engraving which was published in "The Illustrated London News" on Saturday, May 23rd, 1846. The Gem passing the Flag Boat. Cowes Regatta - Starting for the Cup. The First Race between the "Galatea" and the "Mayflower" for the "America" Cup, September 7th - The "Mayflower" crossing the line a winner. An antique woodcut engraving which was published in "The Graphic" newspaper in 1886. Some showthrough of text from the verso. Regatta at Kingstown, Ireland - The Race for the Queens Cup. A woodcut engraving which was published in "The Illustrated London News" on August 5th, 1871. Royal London Yacht - Club Match - The Start from Erith. A woodcut engraving which appeared in "The Illustrated London News". Published on 16th June, 1855. The colouring is later. The yachts "Phantom", "Vampire", "Lily" and "Kitten" are featured. A woodcut engraving which appeared in "The Illustrated London News". Circa 1870. The colouring is later. The yachts "Sverige" and "Rosalind" are shown. Penzance and Mount's Bay, during the late regatta. A woodcut engraving which appeared in "The Illustrated London News" on Saturday, October 3rd, 1857. The colouring is later. 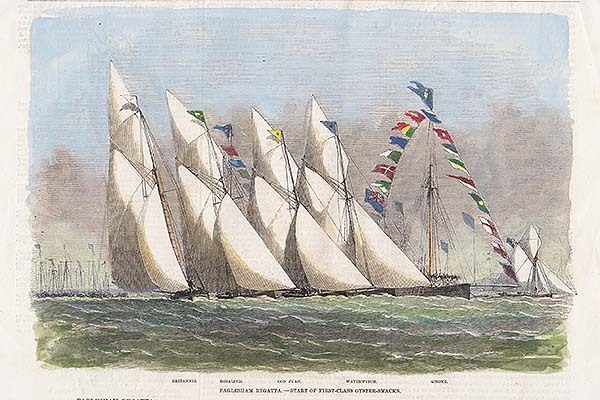 The Royal London Yacht Club Match : The "Julia" winning at Greenwich. A woodcut engraving produced for "The Illustrated London News" Circa 1880.